The Mexican Libertad coin is the official sovereign coin of Mexico. Featuring historic images from one of the first widely distributed Mexican bullion products, the Mexican Libertad is struck today in gold, silver, and platinum variants, with numerous finishes and weights available. 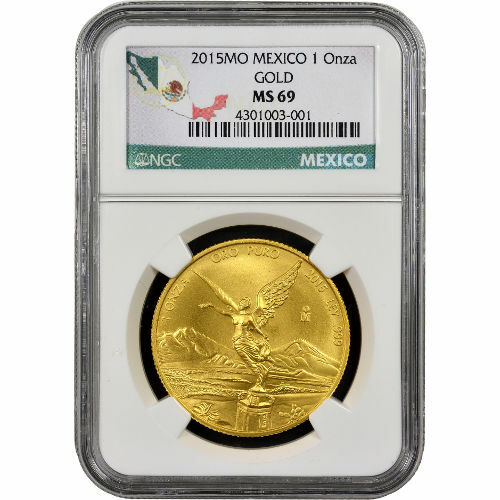 Silver.com currently offers the 2015 1 oz Gold Mexican Libertad Coin in near-perfect condition. 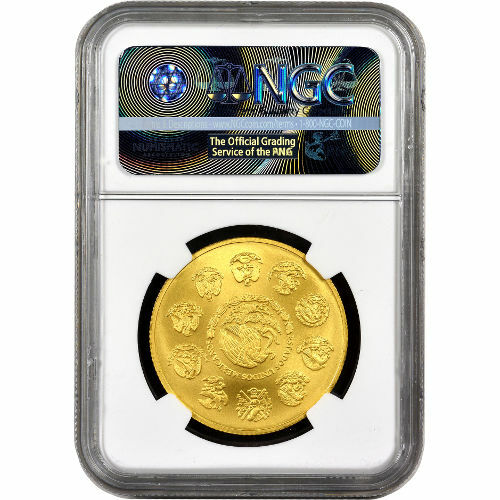 Consists of one troy ounce (1 onza) of .999 fine gold. Features the Angel of Independence and other historic Mexican coinage imagery. Gold Centenario coins were first issued by the Mexican Mint in 1921, and struck through 1947 with images from Mexico’s past that represented the struggle for freedom against Spain. In honor of the nation’s centennial celebration of victory in 1921, the Mexican Mint released the Centenario with the Angel of Independence as the central design figure. In the design, the Angel of Independence is featured holding the wreath (signifying self-governance) in her right hand, while the broken chains of servitude are gripped firmly in her left hand. Each 2015 1 oz Gold Mexican Libertad Coin in this Silver.com listing is a near-perfect product according to the NGC. MS69 coins are characterized by the presence of the full, original mint luster, but also the presence of a maximum of two minor detracting flaws. On the obverse face of the modern Gold Mexican Libertad is the image of the angel on the victory column, as she is depicted in the central square of Mexico City. Engravings include the weight, metal content, purity, and year of issue for the coin, as well as the “MO” mint mark from the Mexican Mint. The reverse is dominated by the Mexican coat of arms. On the 1 oz varieties, the modern coat of arms is encircled by the 10 historic versions of the seal used by the Mexican government since it achieved independence. The Mexican Mint is the oldest operating facility in the Western Hemisphere, having been founded in 1535. Today it prints all official currency for Mexico under the control of the federal government and guidance of the central bank, the Banco de Mexico. If you have questions, please reach out to Silver.com at 888-989-7223, chat with us live online, or send us an email.